Part salad, part cocktail, this Pisco drink infused with fresh cucumber and garnished with mint is perfect when you can’t decide which to serve first at your next dinner party. The key is to prepare the infusion a day in advance, after that you are all set to make one truly cool cocktail. The inspiration for this recipe came from The Pisco Book by Gregory Dicum. But after some experimenting, I settled on the measurements and infusion time shown below. And though this infusion only took 24 hours, compared to the week long Pisco infused with coffee, it was a reminder that good Pisco cocktails come to those who wait. Mix the Pisco infused with cucumber, juice of 1/2 lemon, and simple syrup in a glass. Add ice and top off with soda water. Garnish with a cucumber round and sprig of fresh mint. Peel a fresh cucumber and slice 8 rounds. Place the rounds in a mason jar and add 8 oz. Pisco. Let sit for 24 hours in a cool place away from direct sunlight. 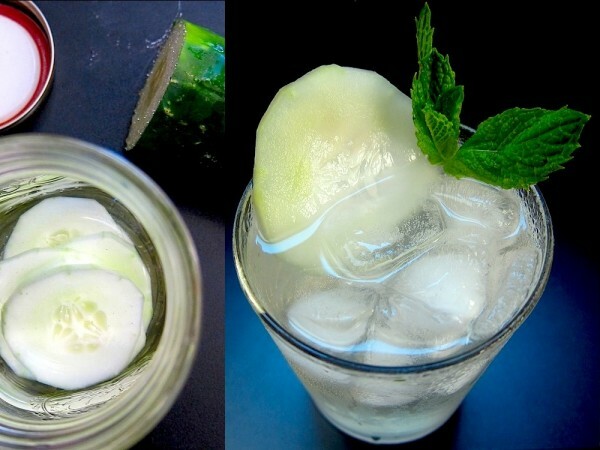 Strain the Pisco infused with cucumber into another container and save the cucumber rounds for garnish. To make the simple syrup, mix 2 oz. sugar with 2 oz. water in a sauce pan, bring to a slow boil, and simmer until the sugar dissolves completely.